Amalie Winters arrives in Italy at her cousin’s invitation. Casey wants to introduce Amalie to her almost fiancé, and Amalie is delighted to meet him and his family. But when she learns that Leo has a cousin, who’s been “roped into” a stint as her tour guide for the next two weeks, she balks. She’s no charity case…and she certainly doesn’t need a new man in her life, even if spending time with the handsome and charming, Giovanni sets her heart aflutter. Giovanni Rossetti doesn’t believe in love at first sight…until he meets Amalie. He tells her he’s been forced to be her tour guide, but spending time with her is the best obligation he’s had in months. But when their cousins’ love affair goes awry, Giovanni and Amalie are forced to face the truth about romance. While they work to mend their cousins’ relationship, will they find their hearts’ desires waiting for them at the Holy See? 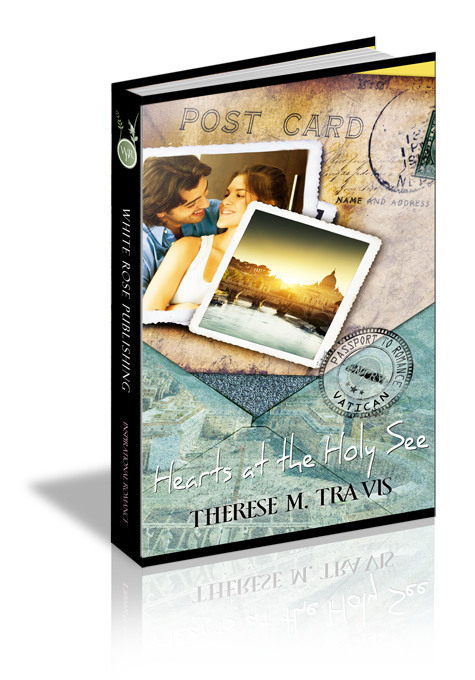 The sheer old-world romance of Vatican City nearly took Amalie Winter’s breath away. The guards in their uniforms—much more regal and imposing than she’d anticipated—the height of the buildings, the breadth of Saint Peter’s Square, all combined to make her feel more as if she’d dropped into another century, rather than another country. The glow of the sunset threw their shadows ahead of them as Amalie followed her cousin through the square. They navigated a wide boulevard screaming with traffic into a slightly quieter, and much narrower, two-lane street. An old street, old in age, old-fashioned in feel, almost like a page from an illustrated manuscript. If Casey weren’t already five steps ahead and moving fast, Amalie would have stopped to soak in the ambiance. “Where are you going?” she called. “Don’t you mean dinner? I think you’re still on U.S. time.” Amalie had no idea what time zone she’d landed in. Exhausted, excited, exhilarated, she didn’t care what the clock said. For the first time in her life, she was in Vatican City. Or—she looked around—just outside the tiny country, and now, in Rome. The light faded from bright, new-coin shiny to a darker tarnished gleam, and the gold of the manuscript lost its glitter. Amalie grinned at Casey as she caught up. Casey made another detour, and they came to a street so narrow, two normal sized vehicles couldn’t pass each other with more than half an inch clearance. But no cars tried. Instead, pedestrians filled the place, making the walk a struggle against whatever tide the rest of the world followed. Casey barreled past three restaurants, each reaching out with scents that tried to grab Amalie by the nose and slow her down. “How much farther—” she started, but Casey was gone, disappearing inside the door of yet another delicious smelling lure. Amalie sidled in after her, just in time to see three waiters converge. The first got to hand Casey a menu, the second threw his arms around Casey, welcoming her in a delightful mix of English and Italian. The third got the consolation prize—Amalie. Used to the phenomenon, Amalie gave him a smile that left him blinking and headed for the group now gathered around her cousin. Amalie studied waiter number two, who had transformed into a young man named Leo—AKA Casey’s one true love. His dark eyes flashed as he gave even more instructions, and he topped the other waiter by several inches—and had towered over Casey. When he turned back, she caught a look on his face which told Amalie that Casey, at least, had picked someone with a true heart. If he weren’t officially Casey’s, Amalie might have swooned. An older couple joined them. The man wore what would be Leo’s face in twenty years, and the woman, dressed in classic black, with gray threading through her hair, motioned them all to a large table which was surrounded by seven chairs. She shouted in Italian at the man, at Leo, and finally, at waiter number one, who scurried off. Casey grinned through it all, but Amalie, after a terrified study of the older woman, edged closer to her cousin. Manuela nodded and beamed. At least she didn’t yell. Amalie introduced herself in a like manner, sure that this might be the only type of communication they’d be able to have unless Leo could tear himself away from mooning over Casey to translate. Or Manuela started shouting again. So this man—this gorgeous man—was the reason Casey had begged Amalie to come to Italy with her, had bribed her with promises of tours of Vatican City, and even, if at all possible, a Mass with the Pope presiding. Amalie’s heart bubbled with excitement. If Casey could deal with her prospective mother-in-law—and Amalie had no doubt Casey could—then her world was set. And if Amalie attended a Mass with the Pope—her world would be full, as well. Waiters number one and three carried out platters brimming with mounds of cheese, bread, olives, and tiny bowls of herb-infused oil, followed by yet another waiter, who carried an armful of small plates and silverware. After he handed these around the table, he pulled napkins from the waistband of his apron and then, with a flourish, sat on Amalie’s other side. The most gorgeous of all men in Italy—even more so than Leo, as if that were possible—sat next to Amalie. She gaped at him then smiled. Chances were, he was yet another member of Leo’s family. He certainly shared the Roman nose, and even better, his dark eyes crinkled at the corners in a way that could set Amalie’s heart pounding. She hoped his English came closer to Leo’s proficiency rather than Bernardo’s. His mouth twitched as he poked at his own chest. “Giovanni Rossetti. Yes, another Rossetti. Leo’s cousin, this time. Pleased to meet you, Casey’s cousin. She’s told us a lot about you.” He held out his hand. “Have you?” He tilted an eyebrow at her and then reached for more olives. “Yes!” Clearly, this man had absorbed at least a drop of Catholic culture.